If you haven’t seen The Last Jedi (yet), please stop reading. Spoilers ahoy. I’ve been listening to many, many podcast episodes about the latest Star Wars film. They’re all here on Huffduffer. You can subscribe to a feed of just those episodes if you want. I am well aware that the last thing anybody wants or needs is one more hot take on this film, but what the heck? I figured I’d jot down my somewhat simplistic thoughts. But I wasn’t sure at first. I’ve talked to other people who felt similarly on first viewing—they weren’t sure if they liked it or not. I know some people who, on reflection, decided they definitely didn’t like it. I completely understand that. A second viewing helped to cement my positive feelings towards this film. This is starting to become a trend: I didn’t think much of Rogue One on first viewing, but a second watch reversed my opinion completely. Maybe I just find it hard to really get into the flow when I’m seeing a new Star Wars film for the very first time—an event that I once thought would never occur again. My first viewing of The Last Jedi wasn’t helped by having the worst seats in the house. My original plan was to see it with Jessica at a minute past midnight in The Duke Of York’s in Brighton. I bought front-row tickets as soon as they were available. But then it turned out that we were going to be in Seattle at that time instead. We quickly grabbed whatever tickets were left. Those seats were right at the front and far edge of the cinema, so the screen was more trapezoid than rectangular. The lights went down, the fanfare blared, and the opening crawl begin its march up …and to the left. My brain tried to compensate for the perspective effects but it was hard. Is Snoke’s face supposed to look like that? Does that person really have such a tiny head? But while the spectacle was somewhat marred, the story unfolded in all its surprising delight. I thoroughly enjoyed the feeling of having the narrative rug repeatedly pulled out from under me. I loved the unexpected end of Snoke in his vampiric boudoir. Let’s face it, he was the least interesting part of The Force Awakens —a two-dimensional evil mastermind. To despatch him in the middle of the middle chapter was the biggest signal that The Last Jedi was not simply going to retread the beats of the original trilogy. Personally, I’d like it if her parentage were unremarkable. Maybe it’s the socialist in me, but I’ve never liked the idea that the Force is based on eugenics; a genetic form of inherited wealth for the lucky 1%. I prefer to think of the Force as something that could potentially be unlocked by anyone who tries hard enough. Though it’s well-grounded in the first definitions of The Force that we were introduced to in the original trilogy, The Last Jedi presents a radically inclusive new view of the Force that is bigger and broader than the Jedi religion which has thus-far colored our view of the entire Star Wars universe. This would be a good time to remind ourselves that, in the Star Wars universe, you can substitute the words “The Force” for “The Plot”—an invisible agency guiding actions and changing the course of events. And then I had the rug pulled out from under me again. Yes! What a joyous bit of trickery! My faith in The Force/Plot was restored. I know a lot of people didn’t like the Canto Bight diversion. Jessica described it as being quite prequel-y, and I can see that. And while I agree that any shot involving our heroes riding across the screen (on a Fathier, on a scout walker) just didn’t work, I liked the world-expanding scope of the caper subplot. Still, I preferred the Galactica-like war of attrition as the Resistance is steadily reduced in size as they try to escape the relentless pursuit of the First Order. It felt like proper space opera. In some ways, it reminded of Alastair Reynolds but without the realism of the laws of physics (there’s nothing quite as egregious here as J.J. Abrams’ cosy galaxy where the destruction of a system can be seen in real time from the surface of another planet, but The Last Jedi showed again that Star Wars remains firmly in the space fantasy genre rather than hard sci-fi). Oh, and of course I loved the porgs. But then, I never had a problem with ewoks, so treat my appraisal with a pinch of salt. For all its global success, Star Wars has always had a very personal relationship with everyone it touches. The films themselves are only part of the reason why people respond to them. The other part is what people bring with them; where they are in life at the moment they’re introduced to this world. And frankly, the films are only part of this symbiosis. As much as people like to sneer at the toys and merchandising as a cheap consumerist ploy, they played a significant part in unlocking my imagination. Growing up in a small town on the coast of Ireland, the Star Wars universe—the world, the characters—was a playground for me to make up stories …just as it was for any young child anywhere in the world. One of my favourite shots in The Last Jedi looks like it could’ve come from the mind of that young child: an X-wing submerged in the waters of the rocky coast of Ireland. It was as though Rian Johnson had a direct line to my childhood self. And yet, I think the reason why The Last Jedi works so well is that Rian Johnson makes no concessions to my childhood, or anyone else’s. This is his film. Of all the millions of us who were transported by this universe as children, only he gets to put his story onto the screen and into the saga. There are two ways to react to this. You can quite correctly exclaim “That’s not how I would do it!”, or you can go with it …even if that means letting go of some deeply-held feelings about what could’ve, should’ve, would’ve happened if it were our story. Han Solo picked up the audience like it was a child that had fallen asleep in the car, and he gently tucked us into our familiar childhood room where we can continue to dream. And then, with a tender brush of his hand across the cheek, he left us. The Last Jedi , on the other hand, thrusts us into this new narrative in the same way you might teach someone to swim by throwing them into the ocean from the peak of Skellig Michael. The polarised reactions to the film are from people sinking or swimming. I choose to swim. To go with it. To let go. To let the past die. That’s exactly what Luke needed to hear. It was also what I—many decades removed from my childhood—needed to hear. Nosedive is the first episode of season three of Black Mirror . It’s fairly light-hearted by the standards of Black Mirror , but all the more chilling for that. It depicts a dysutopia where people rate one another for points that unlock preferential treatment. It’s like a twisted version of the whuffie from Cory Doctorow’s Down And Out In The Magic Kingdom . Cory himself points out that reputation economies are a terrible idea. Nosedive has become a handy shortcut for pointing to the dangers of social media (in the same way that Minority Report was a handy shortcut for gestural interfaces and Her is a handy shortcut for voice interfaces). “Social media is bad, m’kay?” is an understandable but, I think, fairly shallow reading of Nosedive . The problem isn’t with the apps, it’s with the system. A world in which we desperately need to keep our score up if we want to have any hope of advancing? That’s a nightmare scenario. The thing is …that system exists today. Credit scores are literally a means of applying a numeric value to human beings. Nosedive depicts a world where your score determines which seats you get in a restaurant, or which model of car you can rent. Meanwhile, in our world, your score determines whether or not you can get a mortgage. Lenders need not reveal their credit score head, nor need they reveal the minimum credit score required for the applicant to be accepted. Owing only to this lack of information to the consumer, it is impossible for him or her to know in advance if they will pass a lender’s credit scoring requirements. Black Mirror has a good track record of exposing what’s unsavoury about our current time and place. On the surface, Nosedive seems to be an exposé on the dangers of going to far with the presentation of self in everyday life. Scratch a little deeper though, and it reveals an even more uncomfortable truth: that we’re living in a world driven by systems even worse than what’s depicted in this dystopia. Two years ago Douglas Rushkoff had an unpleasant encounter outside his Brooklyn home. Taking out the rubbish on Christmas Eve, he was mugged — held at knife-point by an assailant who took his money, his phone and his bank cards. Shaken, he went back indoors and sent an email to his local residents’ group to warn them about what had happened. I remember when I was first recommended to read Kim Stanley Robinson. I was chatting with Jon Tan about science fiction, and I was bemoaning the fact that dystopias seem to be the default setting. Asking "what’s the worst that could happen?" is the over-riding pre-occupation of most sci-fi. Black Mirror is the perfect example of this. Mind you, that’s probably why the ambiguous San Junipero is one of my favourites—utopia? dystopia? dystutopia? You decide. Anyway, Jon told me I should check out Kim Stanley Robinson’s Three Californias; one book describes a dystopia, one book describes a utopia, and the other—his debut, The Wild Shore —is more ambiguous. I liked the sound of that, but I decided that if I were going to read Kim Stanley Robinson, I should start with his most famous work, the Mars trilogy. So I read Red Mars . I liked it, but I found it tough going. It’s not exactly a light read. I still haven’t read Green Mars or Blue Mars , though I plan to. I can see why Red Mars is regarded as a classic of hard sci-fi, but it left me somewhat cold. Jessica read The Years of Rice and Salt and had a similar reaction—good premise, thoroughly researched, but tough going. When I heard about 2312 , I couldn’t resist its promise of a jaunt around the solar system. Again, I enjoyed it, but the plot—such as it was—didn’t grab me. I loved the ideas presented in the book. Heck, it inspired one of my Science Hack Day projects. Still, I found that its literary conceit wasn’t enough to carry the book—a character from Saturn who’s saturnian in nature meets a character from Mercury who’s mercurial in nature. So I was kind of bracing myself for Aurora . Again, the subject matter really appealed to me. I’m a sucker for generation starships. Brian Aldiss’s Non-Stop was a fun read, although in typical Aldiss style, it was weird to the point of psychedelia (even if it looks positively tame next to the batshit crazy world of Hothouse). I was looking forward to reading Robinson’s hard science take on the space ark idea, but I was worried about how much of a slog the writing might be. I read some reviews and listened to some podcasts, and my heart sank when I heard about how the story is partly told by the ship’s AI, who is simultaneously trying to work out how to tell a story. It sounded just like one of those ideas that would be fine for a brief period, but which I could imagine Kim Stanley Robinson dragging out for hundreds of page. Imagine my surprise when Aurora turned out to be an absolute pleasure. Not only does it have the thoroughly-researched hard science angle of Robinson’s other books, it’s also a rip-roaring tale, in my opinion. I had read of misgivings with the structure of the book—complaints that the story climaxes before the book is halfway done—but I think that misses the point of the story. This is not your typical tale of colonisation. Far from it. Kim Stanley Robinson is quite open about the underlying idea here, that there are certain endeavours that are simply beyond our capacity. I know that sounds like a very pessimistic view, but I found the book to be a real testament to human ingenuity. But it certainly ruffled quite a few feathers. Like I said, the default setting for most sci-fi is to go negative, but for a sci-fi writer to claim outright that something cannot be done is audacious, and flies in the face of sci-fi tradition. Gregory Benford wrote a review over on one of my favourite blogs, Centauri Dreams. He takes Robinson to task for stacking the deck against the crew of the ship in Aurora —an inversion of the usual deus ex machina plot devices. I find that criticism puzzling when another review, also on Centauri Dreams, by Stephen Baxter, James Benford and Joseph Miller, takes the book to task for being scientifically naïve. For me, Aurora was perfectly balanced. It simultaneously captured the wonder of scientific exploration and our own insignificance in the universe. Best of all, it featured central characters that I was utterly invested in—one human, and one artificial. Given my previous experiences with Kim Stanley Robinson books, that was perhaps its greatest achievement. Whereas I might have previously recommended something like 2312 , I would have certainly caveated the recommendation. But I wholeheartedly recommend Aurora . It’s easily the best Kim Stanley Robinson book I’ve read so far, and one of the finest science fiction books of recent years. It makes a great companion piece to Neal Stephenson’s Seveneves —not only are they both dealing with space arks, they’ve also got some in-depth descriptions of angular momentum in action, and they’re both thoroughly enjoyable stories that stretch beyond a single human lifespan. I’m looking forward to digging back through Kim Stanley Robinson’s back catalogue, and I’m very intrigued by his newest book, New York 2140 . From listening to his Long Now talk at The Interval, it sounds like the book has as much to say about near-future economics as it does about climate change. It’s ironic though. Kim Stanley Robinson was first recommended to me because he was one of the few sci-fi writers unafraid to depict a utopia. But his writing never clicked with me until I read Aurora , whose central message sounds like the ultimate downer …that some scientific achievements will forever remain out of reach for humanity. I wrote a little something recently about some inspiring projects that people are working on. Like Matt’s Machine Supply project. 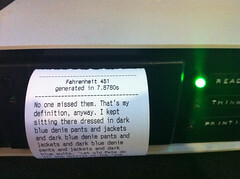 There’s a physical side to that project—a tweeting book-vending machine in London—but there’s also the newsletter, 3 Books Weekly. After I finished reading the final Iain M. Banks novel I was craving more galaxy-spanning space opera. The premise of Ancillary Justice with its description of “ship minds” led me to believe that this could be picking up the baton from the Culture series. It isn’t. This is an entirely different civilisation, one where song-collecting and tea ceremonies have as much value as weapons and spacecraft. Ancillary Justice probes at the deepest questions of identity, both cultural and personal. As well as being beautifully written, it’s also a rollicking good revenge thriller. China Miéville’s books are hit-and-miss for me, but this one is a direct hit. The central premise of this noir-ish tale defies easy description, so I won’t even try. In fact, one of the great pleasures of this book is to feel the way your mind is subtly contorted by the author to accept a conceit that should be completely unacceptable. Usually when a book is described as “mind-altering” it’s a way of saying it has drug-like properties, but The City & The City is mind-altering in an entirely different and wholly unique way. If Borges and Calvino teamed up to find The Maltese Falcon, the result would be something like this. Oh man, it was so hard to narrow this down! So many books I wanted to mention: Station 11 , The Peripheral , The Gone-Away World , Glasshouse , Foucault’s Pendulum , Oryx and Crake , The Wind-up Girl …this was so much tougher than I thought it was going to be. Tell you what — if you’d be up for writing recommendations for another 3 books, from those ones you mentioned, I’d love to feature those in the machine! Station Eleven made think about the purpose of art and culture. If art, as Brian Eno describes it, is “everything that you don’t have to do”, what happens to art when the civilisational chips are down? There are plenty of post-pandemic stories of societal collapse. But there’s something about this one that sets it apart. It doesn’t assume that humanity will inevitably revert to an existence that is nasty, brutish and short. It’s also a beautifully-written book. The opening chapter completely sucker-punched me. On the face of it, this appears to be another post-Singularity romp in a post-scarcity society. It is, but it’s also a damning critique of gamification. Imagine the Stanford prison experiment if it were run by godlike experimenters. Stross’s Accelerando remains the definitive description of an unfolding Singularity, but Glasshouse is the one that has stayed with me. This isn’t an easy book to describe, but it’s a very easy book to enjoy. A delightful tale of a terrifying apocalypse, The Gone-Away World has plenty of laughs to balance out the existential dread. Try not to fall in love with the charming childhood world of the narrator—you know it can’t last. But we’ll always have mimes and ninjas. I must admit, it’s a really lovely feeling to get notified on Twitter when someone buys one of the recommended books. You can listen to an audio version of The Force Awakens. I’d like to talk about The Force Awakens (I mean, really, how can I not?) so there will be inevitable spoilers. Bail now if you haven’t seen the film. Despite much evidence to the contrary, I don’t hang too many of my wants and needs on Star Wars or its continuing life as a franchise. I’m the fan-equivalent of a deep history archeologist, not a pundit or an evangelist. When I heard that Lucasfilm had been sold to Disney, I was intrigued—this could get interesting! When I heard that J.J. Abrams would be directing Episode VII, I was pretty happy—I like his work, and he’s a safe pair of hands. But I didn’t want to get too excited. Partly that’s because I’ve been burnt before—although I’m something of a prequels apologist in comparison to the hatred they inspired in most people. Mostly though, it’s because I’m aware that when it comes to something that doesn’t yet exist—whether it’s a Star Wars film, a forthcoming album, or an upcoming project at work—the more hope you place on its shoulders, the more unlikely it is to be able to fulfil those over-inflated expectations. But as The Force Awakens drew closer and closer, despite my best intentions, I couldn’t help but get excited. Jessica and I watched and re-watched the trailers. The day that tickets went on sale, the website for my cinema of choice crashed, so I picked up the phone and waited in a queue to secure seats for the minute-past-midnight first showing (if you know how much I dislike telephonic communication, you’ll appreciate how unusual that action was for me). I began to literally count down the days. In the final week, Jessica and I re-watched the Star Wars films in Machete Order, which I can highly recommend. That culminated on the evening of December 16th with a gathering ‘round at Andy’s to eat some food, watch Return Of The Jedi , and then head to the cinema before midnight. By the time I was sitting in my seat surrounded by equally enthusiastic fans, I was positively aquiver with excitement. When the fanfare blasted and the Star Wars logo appeared, I was grinning from ear to ear. Then I experienced something really wonderful: I had no idea what was going to happen next. Going into this film with no knowledge of plot details or twists was the best possible way to experience it. I didn’t know what the words of the opening crawl would be. I didn’t know who any of the characters were. I didn’t know what anybody was going to say. I know that sounds like a weird thing to fixate on—after all, didn’t we get that with the prequel films too? Well, not really. Because they were all backstory, there were clearly-delineated constraints on what could and couldn’t happen in those films. But with these new films, anything is possible. I really, really, really enjoyed watching The Force Awakens . But in order to truly evaluate the film on its own merits, I knew I’d have to see it again in more normal circumstances (and who am I kidding? I didn’t need much of an excuse to see it again). I’ve seen it three times now. I loved it every time. If anything, the things that slightly bothered me on first seeing the film have diminished with subsequent viewings. It stands up to repeat watching, something that isn’t necessarily true of other J.J. Abrams films—I enjoyed Star Trek Into Darkness when I first saw it, but with every time I see it again, it grows a little weaker. As I said, there were things that slightly bothered me and I’ll get to those, but my overwhelming feelings about this film are very, very positive. I think the world-building is really good. I think the film itself is superbly crafted, as described in this excellent point-by-point analysis by Chris Dickinson. But above all, what I love the most about The Force Awakens are the characters. Rey. What can I say? She is quite simply a wonderfully-written character brought to life by an astonishingly good performance. And of course I’m going to join in the chorus of people who are glad that we finally get a lead role for a woman in this galaxy. Granted, Star Wars: The Force Awakens isn’t exactly Mad Max: Fury Road , but still, how great is it that 2015 has given us both Rey and Furiousa? Likewise with Finn: great character; great performance. Throw in Kylo Ren, Poe Dameron and even BB8 …I’m sold. I’m invested in their stories now. I want to know what happens next. I want to spend time with them. But The Force Awakens wasn’t just about new heroes and villains. As audacious as it would be to start from an entirely clean slate, it also needed to tie in to the beloved original films. On the whole, I think this film did a good job of balancing the past and the future. Paul came along to that midnight viewing; a ticket became available at the last minute. But he was prepared not to enjoy it, or even understand it, given that he’s never really watched Star Wars. I’m too close to the source material; I can’t objectively judge whether the new film could stand on its own, as opposed to be being the latest episode in an existing saga. As it turned out, Paul really enjoyed it. Sure, there was stuff he was aware he was missing out on, but interestingly, there was even more stuff that we were all missing out on: the script is filled with references to events that happened in the intervening decades between the old films and the new. I liked that a lot. It helped solidify this as being simultaneously a brand new chapter and also just one sliver of a larger ongoing narrative. The Force Awakens is very much a bridging piece between the old and the new. The torch was passed on with dignity, and surprisingly, it was Harrison Ford’s Han Solo that made it a convincing handover. I say “surprisingly” because remember, we had just watched Return Of The Jedi before The Force Awakens and it is so clear that Harrison Ford really didn’t want to be in that film. I know Han Solo is supposed to be somewhat sarcastic, but it was dialled up to 11 for Jedi, and I’m pretty sure it was a very, shall we say, “naturalistic” performance. But here he is over thirty years later, really breathing life into the character. Through the stewardship of Harrison Ford, we were lovingly taken from the original films that we know so well into a new story. Han Solo picked up the audience like it was a child that had fallen asleep in the car, and he gently tucked us into our familiar childhood room where we can continue to dream. And then, with a tender brush of his hand across the cheek, he left us. The biggest gripe that other people have with The Force Awakens is how much the plot resembles that of the original Star Wars . It’s undeniable. The question is how much that matters, and a result, how much it bothers you. It really bothered Khoi. It somewhat bothered Andy. It didn’t bother me much, but it was definitely an aspect that prevented the film from being a complete triumph. But it’s also one of those issues that diminishes with repeated viewing. Those bothered by the echoes between Star Wars and The Force Awakens are going to be really pissed off when they find out about World War One and World War Two. “Britain and America fight Germany again? Really! ?” (Probably best not to even mention any of the Gulf wars). I get the feeling though that the people who are bothered by the plot are perhaps overplaying the similarities and underplaying the differences. So yes, in one sense Rey in The Force Awakens is like Luke in Star Wars —a young person on a desert planet far from the action. But then there are the differences: where Luke was whining about his situation, Rey is mastering hers. And of course there’s the fact that he in 1977 is now she in 2015. “That doesn’t make any difference!” you may cry, and you’d be exactly right: it shouldn’t make any difference …so why has it taken us four decades to get to this? The casting of Rey and Finn is simultaneously unimportant and monumental. It’s unimportant in that it makes no difference to the story whether Rey is a woman or Finn is black. It’s monumental in that they are the main characters in what everyone knew would be the biggest film of the century so far. The rebels killed the Emperor and won, but now they’re ‘the resistance’? Why? They’re backed by the republic, so why aren’t they just the armed forces of the republic? The First Order strikes against the republic (looked like Coruscant, but apparently wasn’t). How big is the First Order? Big enough to build Starkiller Base, but what does that mean? Do they control systems? Do they have support inside the republic? Is this like a separatists thing? How long have they been around? How are they funded? This certainly bugged me. It was the kind of issue that could have been fixed with one explanatory scene. Sure enough, it turns out that such a scene was shot but then cut from the film. Mostly that was to keep the film’s running time down, but I suspect that after the dull talkiness of the prequels, there may also have been some overcompensating course-correction away from anything with even a whiff of politics. Alas, that phobia of trade routes and senators resulted in an unclear backstory. It wasn’t until my third viewing that I realised that Hux’s speech is the closest thing to a blackboard scene for the galactic geopolitics: there’s a proxy war between wannabe extremists looking to set up a caliphate (think ISIS) and a resistance (think the Kurds) being funded by the dominant power (think America) …up until The First Order carry out a 9-11/Pearl Harbour/Vulcan scale attack, leaving the balance of power wide open—the next film could take it in any direction. One of the most impressive achievements of The Force Awakens is that after seeing it, I didn’t want to think about how it tied back to the original films, as I expected I would want to do. Instead, I was entirely preoccupied with questions of what’s going to happen next. She is Luke Skywalker’s daughter. She is Han and Leia’s daughter, the secret sister of Kylo Ren. She is Ben Kenobi’s granddaughter. Lawrence Kasdan has been dropping hints about how odd Episode VIII is going to be, mostly because it has Rian Johnson at the helm. He gave us the terrific Looper . One of the most unsettling aspects of that film was the presence of a child with buried potential for destruction through telekinetic powers. For everyone’s safety, the child is kept far from civilisation. Okay, I know it’s a stretch but what if Rey is on Jakku for similar reasons? Her parents aren’t Skywalkers or Kenobis, they’re just scared by the destructive episodes they’ve experienced with their Force-sensitive infant. With enormous reluctance—but for the greater good—they deposit her on a faraway world. What if Rey is the daughter of Luke and Leia? Eww! I know, I know. But, hey, you can’t say the signs weren’t there all along. And the shame of an incestuous union could be the reason for the child’s secret exile. It’s preposterous of course. Even in a post- Game Of Thrones landscape, that would be going too far, even for Rian Johnson …or would it? Now I’ve planted the idea in your head. Sorry about that. Still, how great is it that we we’re all talking about what’s going to happen next? The belonging you seek is not behind you, it is ahead. I was a guest on the Boagworld podcast—neither Andy nor Richard were available so Paul and Marcus were stuck with me. We talked boring business stuff, but only after an extended—and much more interesting—preamble wherein we chatted about sci-fi books. When prompted for which books I would recommend, I was able to instantly recall some recent reads, but inevitably I forgot to mention some others. I’m not sure if I even mentioned William Gibson’s The Peripheral , an unsurprisingly excellent book. I’m pretty sure I mentioned The Girl In The Road . It has a magical realism quality to it that reminded me a bit of Lauren’s Zoo City . Its African/Indian setting makes for a refreshing change. Having said that, I still haven’t read Ian McDonald’s Indian-set River Of Gods or Cyberabad Days , both of which are sitting on my bookshelf alongside McDonald’s Out On Blue Six , which I have read and can heartily recommend—its imagining of a society where the algorithm decides the fate of all feels very ahead of its time. One book I recommended without hesitation was Station Eleven . Maybe it was because I read it right after reading a book I found to be so-so—Paul McAuley’s Something Coming Through —but the writing in Station Eleven sucker-punched me right from the first chapter. Have a listen to the Boagworld podcast episode for some more ramblings on why I liked it. Somehow I managed not to mention Ann Leckie’s Ancillary Justice and Ancillary Sword . That’s unforgivable. They are easily amongst the best works of sci-fi I’ve read in a read long time. It feels quite exciting to be anticipating the third part in what will clearly be a long-time classic series, right up there with the all-time greats. I first came across Ancillary Justice through some comparisons that were being made to Iain M. Banks’s Culture novels. I was reading his final work, The Hydrogen Sonata , trying to take it slow, knowing that there would be no further books from that universe. But I ended up tearing through it because it was damned enjoyable (not necessarily brilliantly-written, mind; like most of Banks’s books, it’s a terrific and thought-provoking romp but missing the hand of a sterner editor). Anyway, I heard there were some similarities to the Ship Minds to be found in Leckie’s debut novel so I gave it a whirl. As it turns out, there are very few similarities and that’s all for the best. The universe that Leckie is describing has a very different but equally compelling richness. I read Jeff Vandermeer’s Southern Reach trilogy— Annihilation , Authority , and Acceptance —and while I can’t say I enjoyed them as such, I can recommend them …though they are insidiously disturbing, dripping with atmosphere. I’m very intrigued by the news that Alex Garland is working on a screenplay. The Southern Reach Trilogy by Jeff Vandermeer. Alongside the newer stuff, I’ve been catching up with some golden oldies in the form of tattered second-hand novels like Joe Haldeman’s The Forever War , Stanisław Lem’s The Futurological Congress , and Brian Aldiss’s Hothouse . I’m currently working my way through Neal Stephenson’s Seveneves and loving every minute of it. 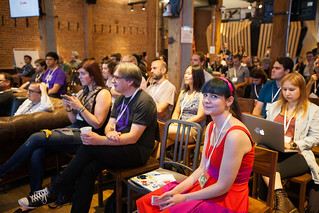 The latest dConstruct 2015 podcast episode is ready for your aural pleasure. This one’s a bit different. John Willshire came down to Brighton so that we could have our podcast chat face-to-face instead of over Skype. The sound quality of this episode is more “atmospheric”, given the recording conditions (you can hear Clearlefties and seagulls in the background) but a splendid time was had by both John and myself. I hope that you enjoy listening to it. I have a feeling that after listening to this, you’re definitely going to want to see John’s dConstruct talk, so grab yourself a ticket, using the discount code ‘ansible’ to get 10% off. 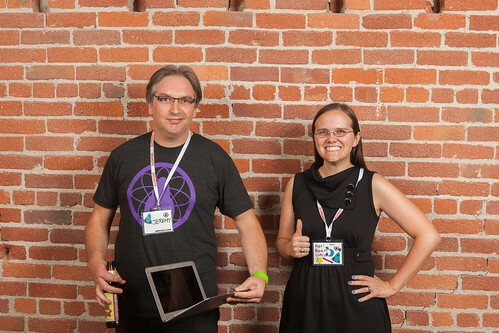 The fourth episode of the warmup podcast for dConstruct 2015 is here, and it’s a good one: it’s the one with Chris Noessel of Sci-fi Interfaces fame. I enjoyed myself immensely geeking out with Chris about the technology presented in sci-fi films like Logan’s Run, Iron Man, X-Men, Metropolis, Under The Skin, and of course, Star Wars. I shared my crazy theory about Star Wars with Chris and he was very gracious in humouring me. The night before the conference, Chris Noessel, one of our fab speakers, will be hosting a very special screening of ‘Guardians of the Galaxy’. The dConstruct podcast episodes are coming thick and fast. Hot on the heels of the inaugural episode with Matt Novak and the sophomore episode with Josh Clark comes the third in the series: the one with Ingrid Burrington. This was a fun meeting of minds. We geeked out about the physical infrastructure of the internet and time-travel narratives, from The Terminator to The Peripheral . During the episode, I sounded the spoiler warning in case you haven’t read that book, but we didn’t actually end up giving anything away. I really enjoyed this chat with Ingrid. I hope you’ll enjoy listening to it. Oh, and now you can subscribe to the dConstruct 2015 podcast directly from iTunes. I enjoy a good time travel yarn. Two of the most enjoyable temporal tales of recent years have been Rian Johnson’s film Looper and William Gibson’s book The Peripheral . Mind you, the internal time travel rules of Looper are all over the place, whereas The Peripheral is wonderfully consistent. Both share an interesting commonality in their settings. They are set in the future and …the future: two different time periods but neither of them are the present. Both works also share the premise that the more technologically advanced future would inevitably exploit the time period further down the light cone. These are patterns that we are all subconsciously aware of anyway, but there’s something about seeing them enumerated that makes us go “oh, yeah” in recognition. This reminds me of a silly idea I had when I was younger. It’s about Star Wars (of course). Specifically it’s about a possible rule—or design principle—underlying the kitbashed used-universe design of that galaxy far, far away. What if the wheel has never been invented in the world of Star Wars? It’s probably not a deliberate omission, but we never actually see a single wheel in the original trilogy (the prequels, as always, are another matter entirely). Sure, there are wheels implied under the imperial mouse droid or under R2-D2’s legs but you never actually see them. Even the sandcrawler, which uses tracks, hides its internal workings. Instead, this is a universe where everything travels via some kind of maglev antigravity even when it seems completely unnecessary—couldn’t you just slap a carbonite Han Solo on a gurney? Whenever a spaceship extends its landing gear we see …skids. Always skids. Never wheels. And what kind of mechanical engineer would actually design something like an AT-AT if it weren’t for a prohibition on wheels? I know you’re probably thinking “this is so stupid”, but I bet you’re also trying to think of an explicit instance of a wheel in the original trilogy. You may also be feeling a growing urge to watch the films again. And whenever you do end up watching the trilogy again, and you find yourself looking at the undercarriage of every vehicle, you’ll realise that I’ve planted this idea Inception-like in your head. Anyway, like I said, the prequels put paid to my little theory. I was genuinely disappointed when those droidekas rolled down that corridor. Remember that feeling of “oh, please!” when R2-D2 used his thrusters to fly in Attack Of The Clones ? You felt cheated, right? The film was breaking the rules of its own universe. Well, a little part of me felt that way when my silly theory was squashed. But just go with it here for a minute. Suppose the wheel had never been invented. Would it be possible for a space-faring civilisation to evolve? It’s generally assumed that you’d need to at least invent fire to achieve any kind of mechanical advances, but what about the wheel? Imagine if George Lucas had actually been playing a design fiction long con. My younger self liked to imagine that lists of instructions were passed around ILM, along the same lines as those Road Runner rules. And one of those instructions would’ve been the cryptic injunction against showing wheels in any vehicle designs. Then imagine what it would have been like if, decades later, Lucas casually dropped the bombshell that the wheel was never invented in this galaxy far, far away. It would’ve blown. Our. Minds. Ah, but it was just a dream. A crazy, apopheniac dream. Jessica and I entered the basement of The Dukes at Komedia last weekend to listen to Sarah and her band Spacedog provide live musical accompaniment to short sci-fi films from the end of the nineteenth and start of the twentieth centuries. It was part of the Cine City festival, which is still going on here in Brighton—Spacedog will also be accompanying a performance of John Wyndham’s The Midwich Cuckoos, and there’s going to be a screening of François Truffaut’s brilliant film version of Ray Bradbury’s Fahrenheit 451 in the atmospheric surroundings of Brighton’s former reference library. I might try to get along to that, although there’s a good chance that I might cry at my favourite scene. Gets me every time. Those 100-year old sci-fi shorts featured familiar themes—time travel, monsters, expeditions to space. 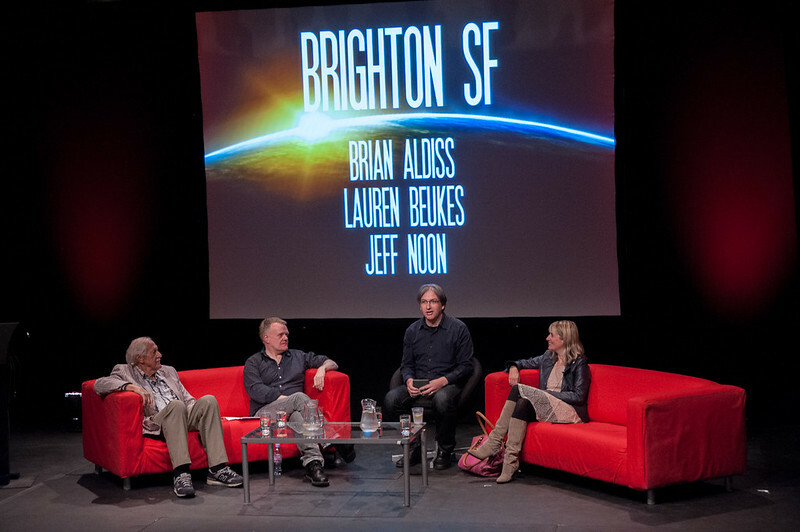 I was reminded of a recent gathering in San Francisco with some of my nerdiest of nerdy friends, where we discussed which decade might qualify as the golden age of science fiction cinema. The 1980s certainly punched above their weight—1982 and 1985 were particularly good years—but I also said that I think we’re having a bit of a sci-fi cinematic golden age right now. This year alone we’ve had Edge Of Tomorrow , Guardians Of The Galaxy , and Interstellar . If you haven’t seen it yet, now would be a good time to stop reading. Imagine that I’ve written the word “spoilers” in all-caps, followed by many many line breaks before continuing. Ten days before we watched Spacedog accompanying silent black and white movies in a tiny basement theatre, Jessica and I watched Interstellar on the largest screen we could get to. We were in Seattle, which meant we had the pleasure of experiencing the film projected in 70mm IMAX at the Pacific Science Center, right by the space needle. I really, really liked it. Or, at least, I’ve now decided that I really, really liked it. I wasn’t sure when I first left the cinema. There were many things that bothered me, and those things battled against the many, many things that I really enjoyed. But having thought about it more—and, boy, does this film encourage thought and discussion—I’ve been able to resolve quite a few of the issues I was having with the film. I hate to admit that most of my initial questions were on the science side of things. I wish I could’ve switched off that part of my brain. There’s an apocryphal story about an actor asking “Where’s the light coming from?”, and being told “Same place as the music.” I distinctly remember thinking that very same question during Interstellar. The first planetfall of the film lands the actors and the audience on a world in orbit around a black hole. So where’s the light coming from? The answer turns out to be that the light is coming from the accretion disk of that black hole. But wouldn’t the radiation from the black hole instantly fry any puny humans that approach it? Wouldn’t the planet be ripped apart by the gravitational tides? Not if it’s a rapidly-spinning supermassive black hole with a “gentle” singularity. These are nit-picky questions that I wish I wasn’t thinking of. But I like the fact that there are answers to those questions. It’s just that I need to seek out those answers outside the context of the movie—I should probably read Kip Thorne’s book. The movie gives hints at resolving those questions—there’s just one mention of the gentle singularity—but it’s got other priorities: narrative, plot, emotion. Still, I wish that Interstellar had managed to answer my questions while the film was still happening. This is something that Inception managed brilliantly: for all its twistiness, you always know exactly what’s going on, which is no mean feat. I’m hoping and expecting that Interstellar will reward repeated viewings. I’m certainly really looking forward to seeing it again. In the meantime, I’ll content myself with re-watching Inception , which makes a fascinating companion piece to Interstellar . Both films deal with time and gravity as malleable, almost malevolent forces. But whereas Cobb travels as far inward as it is possible for a human to go, Coop travels as far outward as it is possible for our species to go. Interstellar is kind of a mess. There’s plenty of sub-par dialogue and strange narrative choices. But I can readily forgive all that because of the sheer ambition and imagination on display. I’m not just talking about the imagination and ambition of the film-makers—I’m talking about the ambition and imagination of the human race. That’s at the heart of the film, and it’s a message I can readily get behind. Before we even get into space, we’re shown a future that, by any reasonable definition, would be considered a dystopia. The human race has been reduced to a small fraction of its former population, technological knowledge has been lost, and the planet is dying. And yet, where this would normally be the perfect storm required to show roving bands of road warriors pillaging their way across the dusty landscape, here we get an agrarian society with no hint of violence. The nightmare scenario is not that the human race is wiped out through savagery, but that the human race dies out through a lack of ambition and imagination. Religion isn’t mentioned once in this future, but Interstellar does feature a deus ex machina in the shape of a wormhole that saves the day for the human race. I really like the fact that this deus ex machina isn’t something that’s revealed at the end of the movie—it’s revealed very early on. The whole plot turns out to be a glorious mash-up of two paradoxes: the bootstrap paradox and the twin paradox. The end result feels like a mixture of two different works by Arthur C. Clarke: The Songs Of Distant Earth and 2001: A Space Odyssey . 2001 is the more obvious work to compare it to, and the film readily invites that comparison. Many reviewers have been quite to point out that Interstellar doesn’t reach the same heights as Kubrick’s 2001 . That’s a fair point. But then again, I’m not sure that any film can ever reach the bar set by 2001 . I honestly think it’s as close to perfect as any film has ever come. But I think it’s worth pointing out that when 2001 was released, it was not greeted with universal critical acclaim. Quite the opposite. Many reviewers found it tedious, cold, and baffling. It divided opinion greatly …much like Interstellar is doing now. In some ways, Interstellar offers a direct challenge to 2001—what if mankind’s uplifting is not caused by benevolent alien beings, but by the distant descendants of the human race? This is revealed as a plot twist, but it was pretty clearly signposted from early in the film. So, not much of a plot twist then, right? Well, maybe not. What if Coop’s hypothesis—that the wormhole is the creation of future humans—isn’t entirely correct? He isn’t the only one who crosses the event horizon. He is accompanied by the robot TARS. In the end, the human race is saved by the combination of Coop the human’s connection to his daughter, and the analysis carried out by TARS. Perhaps what we’re witnessing there is a glimpse of the true future for our species; human-machine collaboration. After all, if humanity is going to transcend into a fifth-dimensional species at some future point, it’s unlikely to happen through biology alone. But if you combine the best of the biological—a parent’s love for their child—with the best of technology, then perhaps our post-human future becomes not only plausible, but inevitable. Thinking about the future of the species in this co-operative way helps alleviate the uncomfortable feeling I had that Interstellar was promoting a kind of Manifest Destiny for the human race …although I’m not sure that I’m any more comfortable with that being replaced by a benevolent technological determinism. 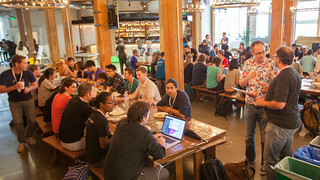 Science Hack Day San Francisco was held in the Github offices last weekend. It was brilliant! 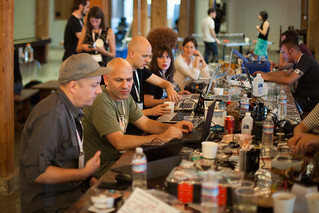 This was the fifth Science Hack Day in San Francisco and the 40th worldwide. That’s truly incredible. I mean, I literally can’t believe it. When I organised the very first Science Hack Day back in 2010, I had no idea how far it would go. But Ariel has been indefatigable in making it a truly global event. She is amazing. 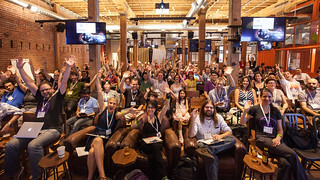 And at this year’s San Francisco event, she outdid herself in putting together a fantastic cross-section of scientists, designers, and developers: paleontology, marine biology, geology, astronomy, particle physics, and many, many more disciplines were represented in the truly diverse attendees. 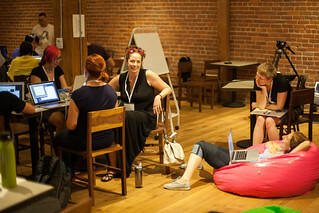 After an inspiring set of lightning talks on the first day, ideas started getting bounced around and the hacking began to take shape. I had a vague idea for—yet another—space-related hack. What clinched it was picking the brains of NASA’s Keri Bean. 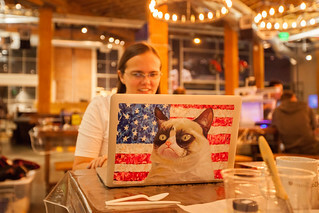 She’d help me get hold of the dataset I needed for my silly little hack. There are many possibilities for human habitats in space: Stanford tori, O’Neill cylinders, Bernal spheres. 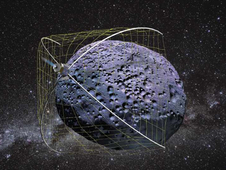 Another idea, explored in science fiction, is hollowing out asteroids (Larry Niven’s bubbleworlds). Kim Stanley Robinson explores this idea in depth in his book 2312, where he describes the process of building an asteroid terrarium. The website of the book has a delightful walkthrough of the engineering processes involved. It’s not entirely implausible. I wanted to make that idea approachable, so I thought about the kinds of people we might want to have living with us on the interior shell of a rotating hollowed-out asteroid. How about the people you follow on Twitter? The only question that remains then is: which asteroid is the right one for you and your Twitter friends? Keri tracked down the motherlode of asteroid data and I started hacking the simplest of mashups—Twitter meets space rocks. Give it your Twitter username and it will tell you exactly which one of the asteroids in the main belt is right for you (I considered adding an enterprise option that would tell you where you could store your social network in the cloud …the Oort cloud, that is). Be default, your asteroid will have the population density of Earth, which is quite generously. But if you want a more sparsely-populated habitat—say, the population density of Australia—or a more densely-populated world—with something like the population density of Japan—then you will be assigned a larger or smaller asteroid accordingly. You’ll also be told by how much you should increase or decrease the rotation of the asteroid to get one gee of centrifugal force on the interior. Figuring out the equations for calculating centrifugal force almost broke me, but luckily I had help from a rocket scientist and a particle physicist …I’m not even kidding. And I should point out that the calculations take some liberties—I’m assuming a spherical body, which is quite a stretch, given the lumpy nature of most asteroids. At 13:37 on the second day, the demos began. Keri and I were first up. 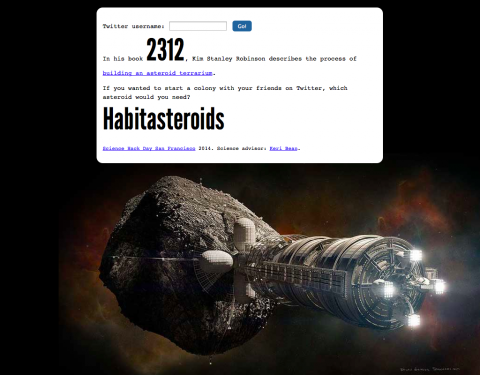 Give Habitasteroids a whirl for yourself. It’s a silly little thing, but I quite like how it turned out. 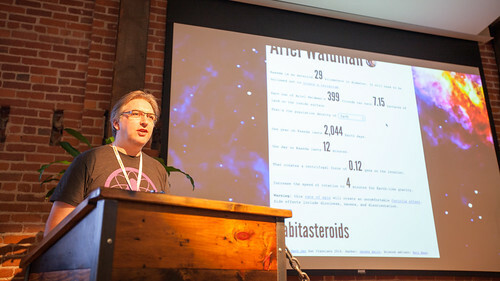 Speaking of silly things …at some point in the proceedings, Keri put the call out for asteroid data to her fellow space enthusiasts on Twitter. They responded with asteroid-related puns. @lukedones @JLGalache @PlanetaryKeri @motorbikematt @adactio Recruiting the rest of your astro Pallas to get in on the asteroid pun action? @brianwolven @lukedones @JLGalache @PlanetaryKeri @motorbikematt @adactio Your puns give me the Hebe jeebies. @brx0 @lukedones @JLGalache @PlanetaryKeri @motorbikematt @adactio Ida feeling that might happen eventually. @brianwolven @lukedones @JLGalache @PlanetaryKeri @motorbikematt @adactio It’ like you’re Psyche or something. @lukedones @brx0 @JLGalache @PlanetaryKeri @motorbikematt @adactio @paix120 With this crew, at least the pun Themis pretty obvious. @brianwolven @lukedones @brx0 @JLGalache @PlanetaryKeri @motorbikematt @adactio You guys sure know Alauda asteroid names. @brianwolven @lukedones @brx0 @JLGalache @PlanetaryKeri @motorbikematt @adactio Europa creek if u’re Wikipedia’ing like me. Thisbe the end. @paix120 @brianwolven @lukedones @JLGalache @PlanetaryKeri @motorbikematt @adactio The end? So this is the last Gaspra? @brx0 @paix120 @brianwolven @jlgalache @planetarykeri @motorbikematt @adactio We should probably stop at Gaspra before we reach Eros. @brianwolven @paix120 @lukedones @JLGalache @PlanetaryKeri @motorbikematt @adactio I Echo this sentiment. @lukedones @paix120 @brianwolven @JLGalache @PlanetaryKeri @motorbikematt @adactio Too late. Pandora’s box has been opened. @brx0 @lukedones @brianwolven @JLGalache @PlanetaryKeri @motorbikematt @adactio tho, someone might Summanus to the Psyche ward. @paix120 @brx0 @brianwolven @jlgalache @planetarykeri @motorbikematt @adactio Have Merxia on us all! @paix120 @lukedones @brianwolven @JLGalache @PlanetaryKeri @motorbikematt @adactio Every other Twitter pun game Pales in comparison. 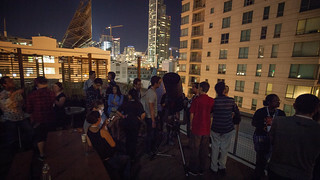 They have nice asteroids though: @brianwolven, @lukedones, @paix120, @LGalache, @motorbikematt, @brx0. Oh, and while Habitasteroids might be a silly little hack, WRANGLER just might work. Today was a travel day. It was time to leave our most excellent hosts in Philadelphia and make our way to Jessica’s parents in Sierra Vista, Arizona. I spent most of the travel time with my headphones on, listening to music and reading on my Kindle. I finished Kim Stanley Robinson’s 2312, a thoroughly enjoyable—if not exactly tightly-plotted—romp around the solar system, and started in on Lauren’s latest, The Shining Girls . It’s a real page-turner. 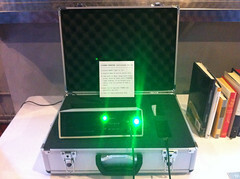 Or, in the case of the Kindle, a real button-pusher. For take-off and landing, headphones and Kindles have to be stowed so I always make sure I’ve got a good ol’ dead-tree tome with me on any plane journey. On this occasion I started into a copy Rainbows End by Vernor Vinge that I picked up at a second-hand bookstore in Alexandria earlier this week. There was no direct way to get from Philadelphia to Tucson, the nearest airport to Sierra Vista. Layovers were inevitable. We flew with Delta, which meant that our layover would be at their hub in Atlanta. 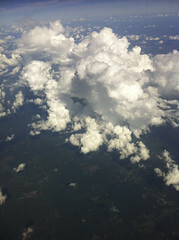 The flight from Philly to Atlanta was pretty straightforward, but we could see storm clouds brewing. After a stopover in Atlanta for a couple of hours, we continued on to Tucson, by which time the storm clouds were brewed and angry. 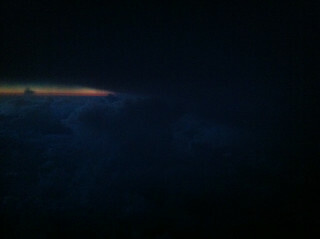 As we chased the sunset, we flew over a landscape of explosions in the sky. Dark cloudscapes erupted with light every minute or so. It looked like a bombardment of multiple timezones. At one point, Jessica saw a shooting star. It was as if the Perseids were MIRVing to deliver angry payloads of light flashes while we flew unscathed above it all.